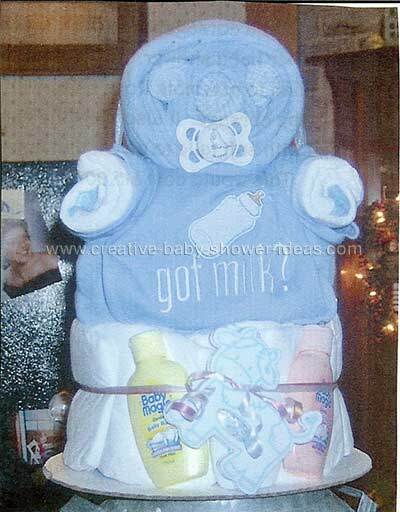 A diaper baby cake can make a fun gift for any baby shower. Not only does it give useful gifts, but it makes a beautiful statement. This section has pictures of cakes that look like babies. Other cake categories can be reached below through our index. 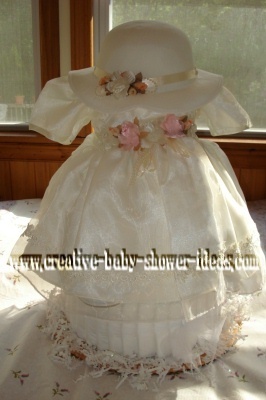 You will love baby girl in this picture perfect dress. 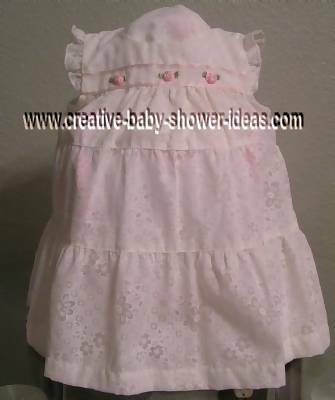 This heirloom dress will be passed down from baby to baby. 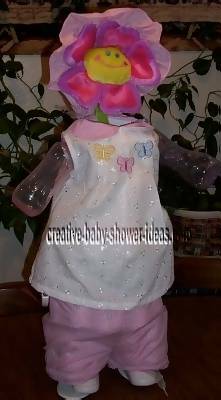 Details: This is another diaper cake designs I have come up with this small 5 tier beautiful baby dress diaper cake measures 14"x14"x21". Tiers are wrapped with white tulle and satin ribbon. 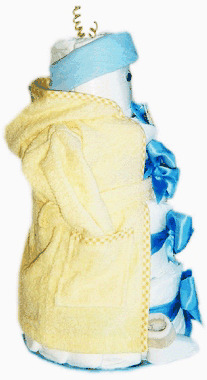 Some items are hidden inside the center of the cake and others are secured to the layers under the dress. There is white diamond shred in between layers to look like icing. 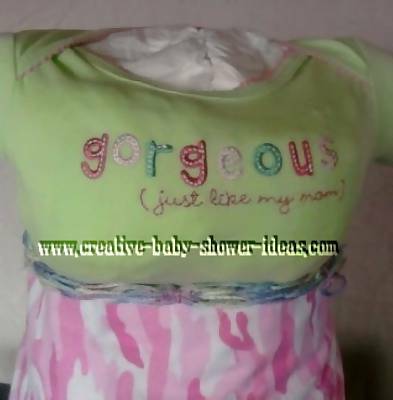 I made this and many other models out of pampers or towels. First I made them as private gifts. Since then I have gotten crazy about them. I started last October my own E-Shop. 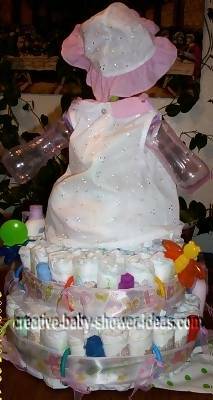 For this diaper cake I used 4 Layers of pampers (60 newborn diapers), a cake plate, a baby-bathrobe, a pair of socks, 1 pacifier, bib, 1 pair self adhesive eyes. 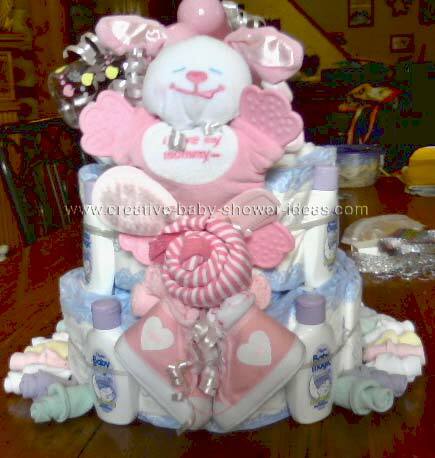 This diaper cake was done for a girl baby shower gift. It has so many wonderful items on it. The person who purchased it was extremely happy, and the receiver said it was her favorite gift. These are just so fun and rewarding to make. 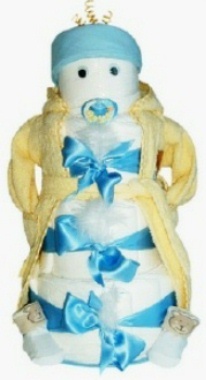 This is a simple diaper cake with 5 tiers and your basic baby items. As you can see I placed the shirt on it, but the shorts and shoes are only placed in front of it. Then I thought legs would be cute. I used doll stands to hold it up. I tied the bottles on the arms of the shirt and added the duck pond. 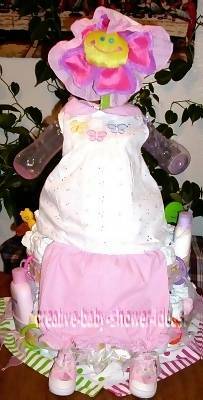 I made this "Diaper cake" for my eldest sister who is having a girl. She really didn't have a theme, so I had to come up with my own idea. 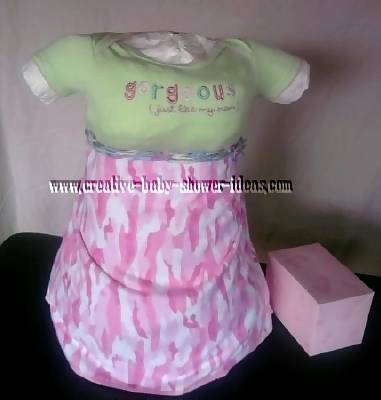 Her hubby wanted pink camouflage, so I decided to make a dress that was both girly and had pink camo in it. This is the first time I have made this kind. I think it turned out pretty good. My 10 yr. old daughter knitted the band around the waist. This will be the first girl born in our family since my daughter. We are ready for a girl!